Note 3/27: this is a repost back from September 3, 2013. Enjoy! We woke up to sun to subtle drips and taps on the top of the tent. (Ugg. Rain.) We had enough of the Arctic Circle. 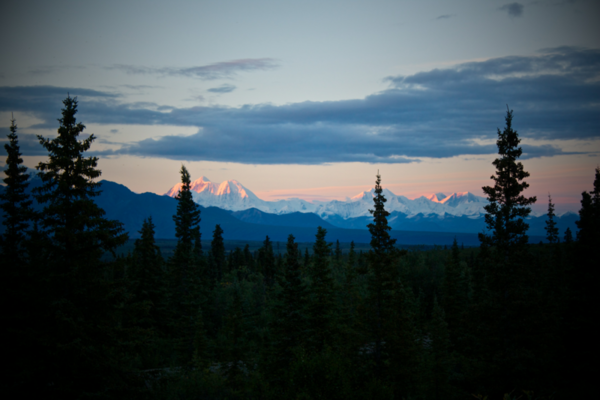 We packed up with haste and began our journey back down to Fairbanks (and beyond). More info about Day 8 after the break..
We donned our Aerostich Triple Digit covers and cruised down the Dalton. Luckily the only thing the rain did was keep the dust down. Smooth sailing..
We reached Yukon River Camp about an hour and a half after leaving the circle. We topped our tanks off and bid the tank of stinky gas ado. 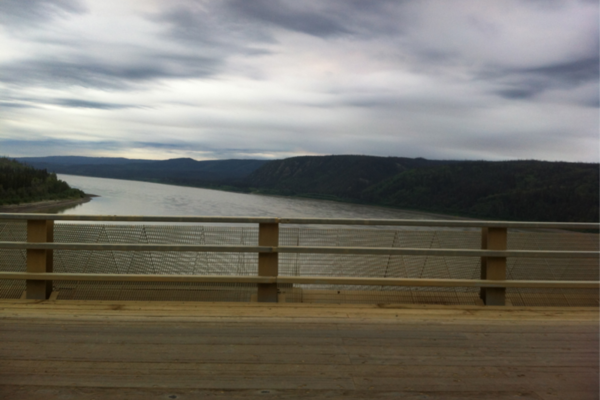 Before we left the area we did manage a couple photos of the Yukon River Camp bridge. I definitely have respect for anyone who built a bridge over this mindblowingly powerful river. We, now understanding how packed the gravel was, hightailed it down the Dalton. 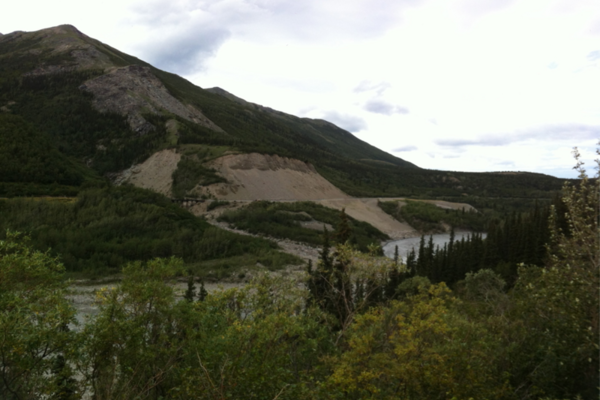 We were able to reach Fairbanks around 3 hours after leaving Yukon River Camp. Not bad..
We stopped for gas, gave our bikes a scrub at the self car wash (near 514 Old Steese Hwy, Fairbanks, AK), and grabbed some Subway (yum). Tip: Prepare to spend at least 5-6 dollars per bike at the self wash. If you are washing multiple bikes at the same time I recommend putting them in the same bay. It is a more efficient way to manage your time on the spray clock. We sat and pondered our next move while we munched on our sandwiches and bruised apples*. We checked the weather around the state. It appeared the rain down south was breaking up. * Tip: We didn’t have much luck packing the food in my aluminum top case without our food getting pulverized. (Picture pulverized teddy grahams, leaky peanut butter jars, leaky apple butter jars, etc.) It may be best to use a separate ruck that you can strap onto your bike. If anyone else has suggestions feel free to chime in! 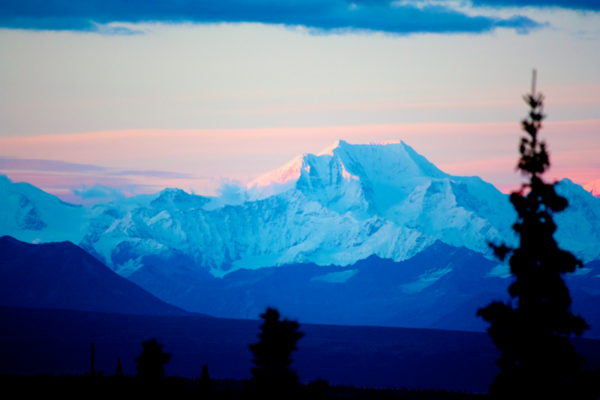 Google: Weather - Denali AK –> Partially Cloudy. 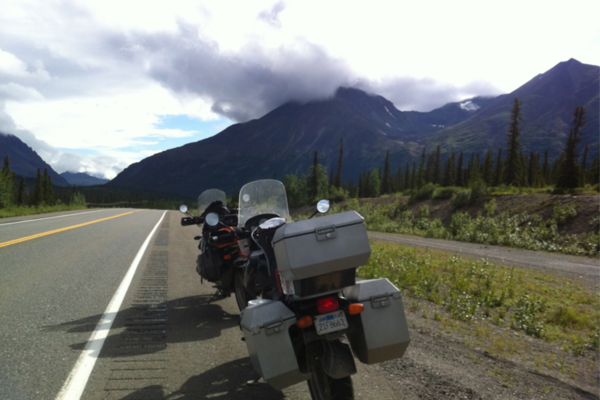 So with our bearing set, our stomachs full and our bikes (mostly) clean we headed out for the George Parks highway. Unfortunately for a good portion of our ride it was smoggy from the forest fires and rainy. We were missing out some possibly awesome views. We kept trucking looking forward to seeing some of the best views in Alaska. After riding for a while in and out of construction, the mountains and hills started getting larger. There were more streams and rivers running by the road as we proceeded along our route. It felt like, for the first time this whole trip, we were entering the threshold to the real Alaska. No doubt that it was beautiful on the Dalton and the Top of the World but the closer we got to Denali the less we remembered about how much we loved the routes we had already traversed. We reached our final fuel stop around 18:38. We ran into a bunch of other adv. riders passing through. 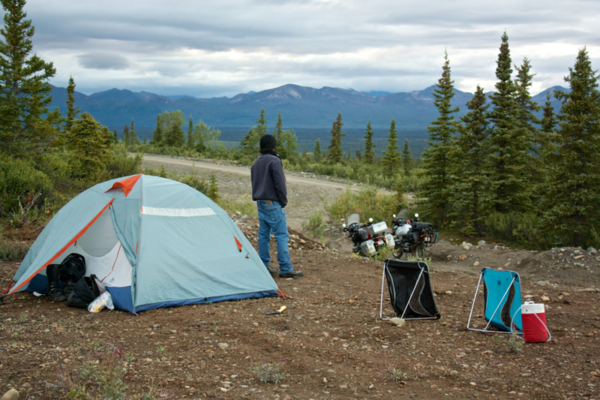 They had heard that the Denali was in fair shape (according to now our good friend @ Motoquest). 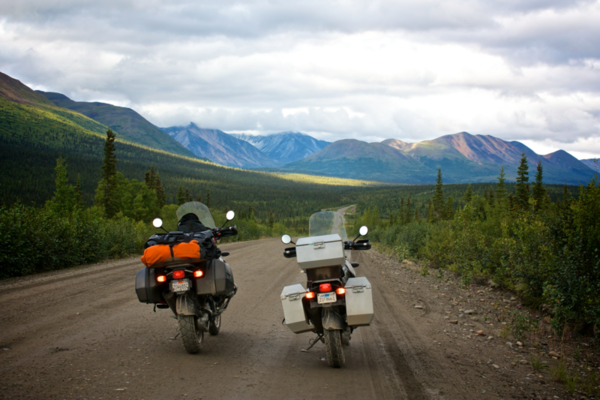 They also recommended taking a ride to Kennicott if we had the chance. We took a mental note. We said thanks and parted ways. Things were looking good for the Denali. We were ready! We hopped back on the George Parks and not 2 minutes down the road from the gas station in Cantwell we found the entrance to the Denali Highway. 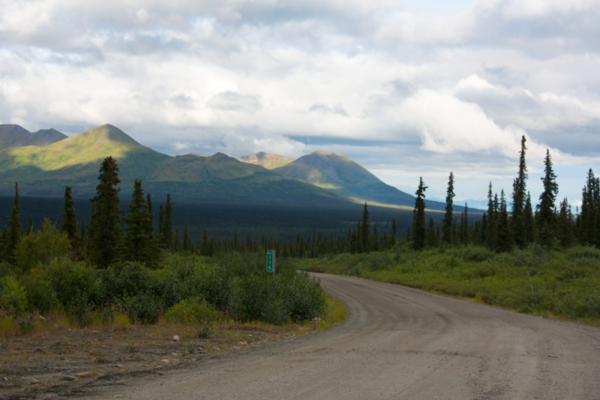 We took a left turn to our Alaskan destinies as we barreled down the paved road. We had arrived. We continued to ride managing only to stop about every 20 feet to take pictures. This place is amazing. I couldn’t find anyone else on this road that didn’t have a smile on their face. I would dare to argue that people calling Disneyland the happiest place on earth are misinformed. I saw some happiest kids spending time with their families camping out along the sides of the road. We even got a few waves! 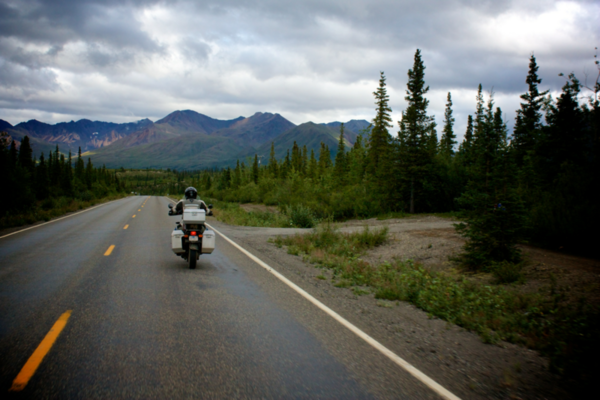 We rode about 38.7 miles into Denali when we finally called it quits. We found a good spot that was elevated above the road. We had a full (cloudy) view of the area and the snow peaked mountains. Unfortunately though, McKinley (aka. 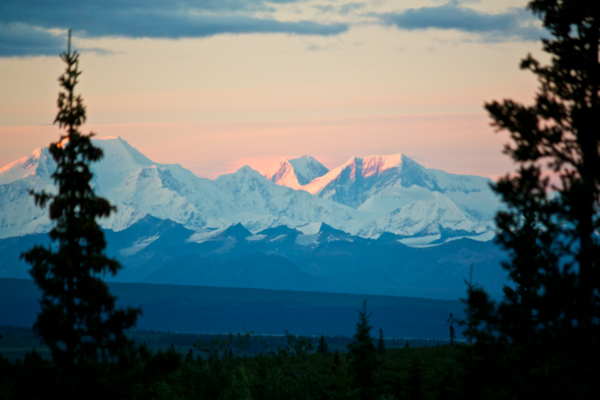 Denali) was not viewable. 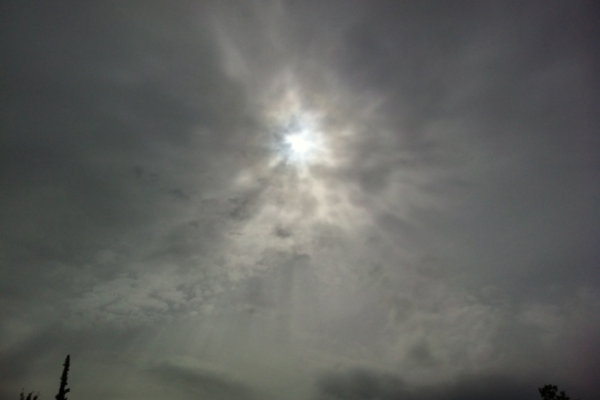 It was covered in clouds, which were rolling in from the south. 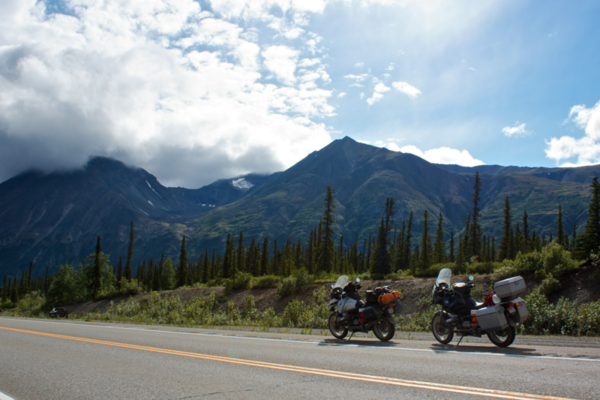 Luckily we would be able to see it later in our trip..
One of the things we couldn’t have left home without was The Adventurous Motorcyclist’s Guide to Alaska by Phil Freeman and Lee Klancher. This book in conjunction with the Milepost provided us with some of the most valueable information while we were riding around in the wilderness. 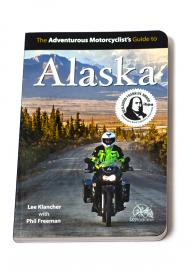 In Phil and Lee’s book, they cover all the major routes in Alaska and also cover some less traveled off road routes. They included some gas, food, and some local touristy information as well. Overall, as long as they catch these issues in the second edition I think this book will be really solid. 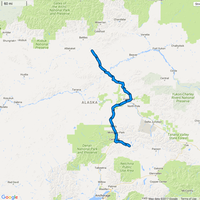 Highly reccomended not only for the adventure rider but also for anyone else considering riding their motorcycle in Alaska. You can find it here. How do I sell a used motorcycle?